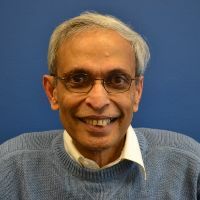 Director of CWRU University Center for Innovation in Teaching and Education (UCITE); Adjunct Associate Professor of Physics. He obtained his B.S. from the University of Colombo in Sri Lanka, and M.S. and Ph.D. degrees in theoretical nuclear physics from the University of Pittsburgh. He is a Fellow of the American Physical Society. His recent research interests are in the fields of education, theories of knowledge, and physics and philosophy. His first book was THE QUEST FOR TRUTH: Scientific Progress and Religious Beliefs (2000). His second book The Achievement Gap in U. S. Education: Canaries in the Mine (2005) deals with the educational achievement gap between white and black students. His third book God vs. Darwin: The War Between Evolution and Creationism in the Classroom (2009) deals with how challenges to the teaching of evolution in schools have themselves evolved as a result of repeated setbacks in the courts. His keynote is titled “The Paradox of Science:How We Can Be Sure Without Being Certain”.